Continuing from last weeks post, I am now looking at space launch sites. Data are from the main table. In addition, this sites table was manually browsed for interpretation of abbreviations. Just by running counts the most important locations (more that 100 counts) are visible. As can be seen, each site has two parts. LC is an abbreviation for launch complex. In addition, for each site the country is determined. This led me to some confusion. Some locations seemed to be on the moon. However, I could not find the launches of the Apollo astronauts back from the moon. Finally, to remove this confusion and for ease of depiction I have only taken the locations with more than 10 counts. Two locations are not countries. A sea platform (Odyssee) and plane launch (Lockheed L-1011). 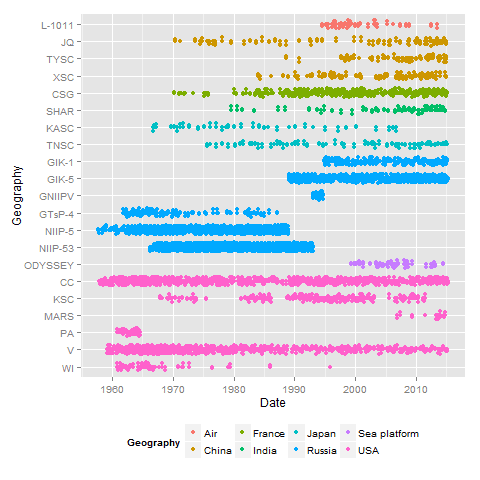 The plot shows the renames in Russia, but also the parallel usage of the names KSC and CC by the USA. VandenBerg gets used less over time. China and India got more active in the recent years.